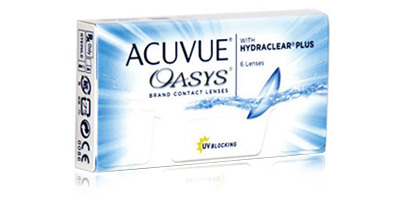 From renowned manufacturer Johnson & Johnson, Acuvue Oasys two weekly disposable contact lenses combine exceptional comfort and convenience with superior clarity of vision and eye health benefits including 98% UV-B blocking. 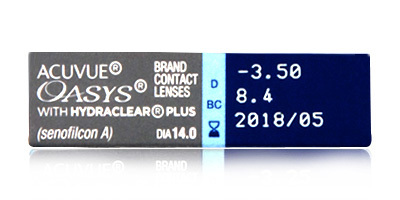 If you’re near or far sighted and want a high performance durable lens that can handle the stresses and strains of modern life, this is an excellent place to start. Johnson & Johnson developed Acuvue Oasys for people with busy lifestyles in need of a lens that can handle changing environments effortlessly. These bi-weekly disposables supply uninterrupted vision in all light conditions and can cope with everything from air conditioning and dry heat to high pollen levels and extended periods spent in front of a computer screen. Thanks to the high level of permeability, eyes don’t suffer from the damaging and uncomfortable effects of oxygen deprivation. 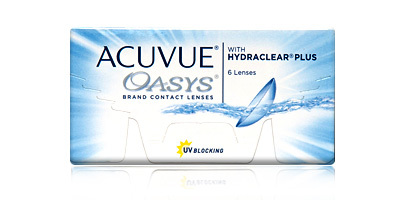 Acuvue Oasys contact lenses feature Johnson & Johnson’s Hydraclear Plus system, which allows up to 98% of available oxygen than usual to reach the cornea easily and consistently. This in turn enables the eye to breathe better and keep itself naturally hydrated and healthy all day. Need assistance? Call our dedicated customer services team on freephone 0800 037 4000. 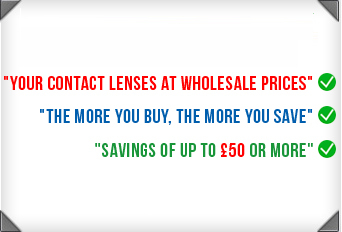 Need your contact lenses the next day? Choose express delivery and have them delivered to your home or work address in the blink of an eye! You dispatch fast in convenient packaging, making me very happy: The package from you is delivered very quickly, and it slides right through the letterbox (i.e. I don't have to go to the Delivery Office to collect it).